This is what the countertop looked like when we arrived at the job site, before any granite refinishing work. This image was taken during the countertop restoration process. You can clearly see which areas are before and after. Notice the reflection of the plastic sheets and light from the windows like a mirror on the refinished granite. These side-by-side before and after images demonstrate the incredible results all our customers can expect. 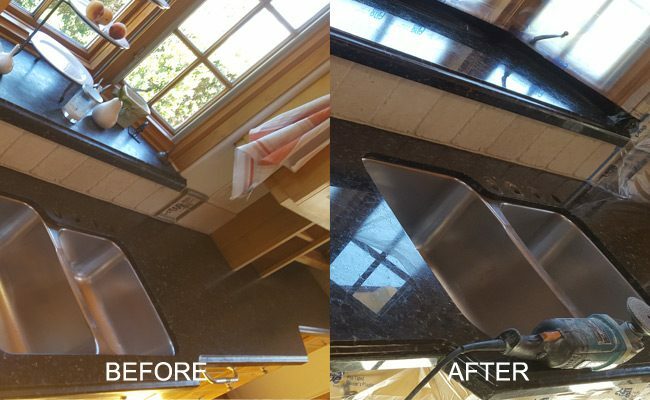 The uba tuba granite countertops in a Los Angeles home were extremely dull and etched due to improper cleaning solutions, hard water and soap residue, and years of use with no professional attention. The homeowners called us to find out whether the finish could be restored or if the countertops would have to be replaced. 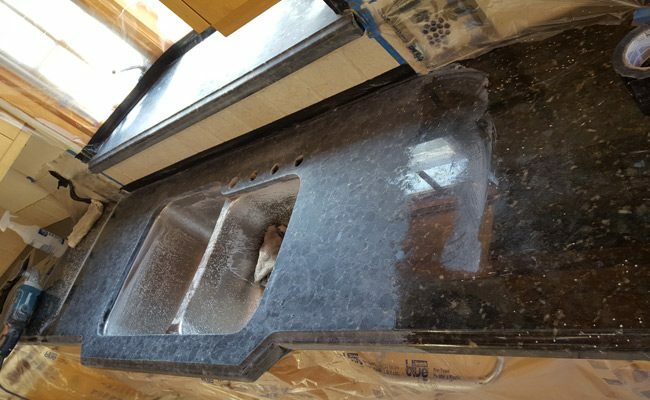 We assured them that their granite would have a like-new appearance by the time we finished working our magic. Granite etching, sometimes called water stains or a dull spots, is a chemical reaction that happens when acidic substances such as alcohol or fruit juice come into contact with the calcium in natural stone. 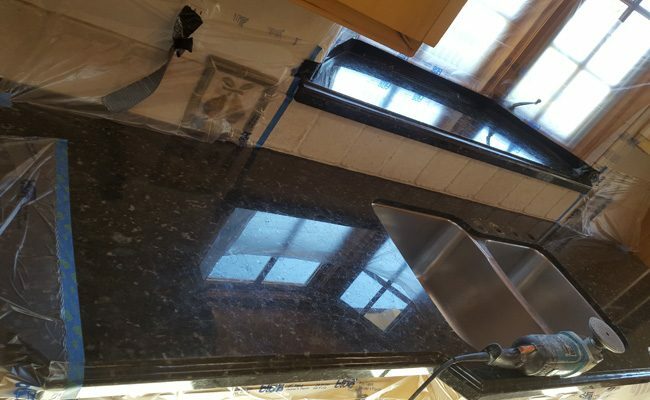 Although some granites are extremely resistant to etching, any granite with a high level of calcium will be susceptible to this type of damage. Etching cannot be wiped or cleaned off of stone, it must be removed very carefully using DIY methods (not recommended) or removed through professional honing and polishing (recommended). First, we masked and protected surrounding areas with clear plastic sheets. Then, we honed the granite using a series of progressively finer grits (220-400-800 grit diamond hone) and polished to restore the glossy, reflective finish. Finally, we sealed the stone to inhibit staining. 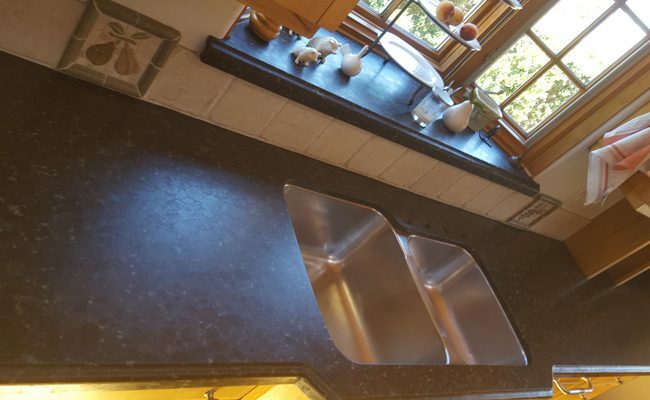 The homeowners were relieved to see the etch damage and dullness completely removed and pleased that the granite finish looked as if the countertops had just been installed. If you live in the Los Angeles area and your granite, marble, or other natural stone vanity top, countertop, or other surface has become etched, contact us online or call 619-246-0240 to discuss your options.